Week 10 of the 2018 NFL season produced another slate of thrilling matchups, which included three big upsets. 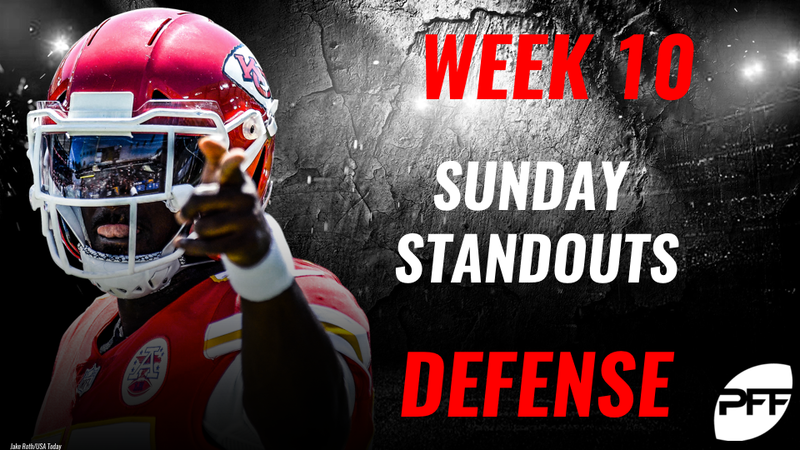 As we’ve seen over the first half of the season; one stop, one pass breakup or one pressure in an opportune, high leverage situation often makes the difference between a win and a loss in today’s NFL, so let’s highlight some of the players on the defensive side of the ball who stood out and made a difference in Week 10. Ford continues to cement himself as one of the league’s premier edge defenders. Against the Cardinals on Sunday afternoon, the outside linebacker produced a sack, three hits and five hurries on his 33 pass-rushing snaps. The Chargers’ second-round pick continues to flash in his limited snaps. Against the Raiders in Week 10, he produced a sack, two hits and three hurries on his 23 pass-rushing snaps. While Ford has commanded a lot of attention, Jones deserves recognition for his stellar performance versus the Cardinals. He harassed Josh Rosen all day to the tune of two sacks, a hit and four hurries. He also logged two batted passes and forced a fumble. Milano flew around the field making plays for the Bills defense on Sunday. He was particularly impressive in coverage, where he allowed just one reception for 18 yards on four targets, and he also snagged an interception in the process. He allowed just 0.75 yards per coverage snap and a passer rating of 6.3. The Bears defense dominated the Lions on Sunday, and that includes a strong performance from veteran cornerback Prince Amukamara. He amassed eight tackles and allowed six receptions from 10 targets for a total of 78 yards. He managed to corral an interception, and he allowed a 45.0 passer rating when targeted. The Eagles fell to the Cowboys on Sunday Night Football, but Jenkins still had a productive evening. Jenkins logged an impressive nine total tackles and five defensive stops on the night. He allowed just one reception for five yards in coverage. Another Bear makes the list, as Bryce Callahan turned in one of the best performances of the week. He was targeted six times, but allowed only three receptions for 16 yards, while he also produced an interception. Callahan locked down the slot and allowed an abysmal 8.3 passer rating on throws into his primary coverage. Despite the loss to the Cowboys, Fletcher Cox was his usual self in the trenches. The star defensive tackle registered a hit and four hurries on the night, to go along with three tackles and three defensive stops. He was a factor against the run and the pass, producing a run stop percentage of 15.0% and a pressure percentage of 10.7%.